Over a millennium ago, when the borderlands were in the dark grip of the Zaharan Empire, the empire's sorcerer-priests erected a profane temple to house the terrible artifact known as the Stone of Sakkara. Using the Stone, the sorcerer-priests could birth monsters and abominations with frightening ease and magically command the loyalty of chaotic creatures. The Stone brought its evil masters great power throughout the fell empire. 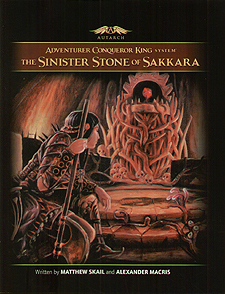 AX1: The Sinister Stone Sakkata is a ready-to-play adventure presented for use with Adventurer Conqueror King System and other d20-based fantasy role-playing games. AX1 includes a two-level dungeon filled with cthonic horror along with a friendly stronghold from which your adventurers can explore the region. The Sinister Stone of Sakkara is the perfect introductory adventure for a campaign starting in ACKS's official setting but easy to adapt to your campaign setting of choice. Begin your rise from adventurer to king today!